These are one of my favourite things to make. They are super easy, fast, tasty and filling! I’ve played around with the ingredients a bit and I will give you alternative options at the end. Sooo green – should have posted these on Paddy’s Day!! You will need two small bowls, measuring cups or just a regular mug , a dessertspoon and a teaspoon. There are a couple of options in regards to flavouring you can..
Get one of the bowls, put in your coconut oil and mash it a bit so it softens. Add your extract- mash again. Add your agave syrup and mix until it is all combined well. Now put your ground almonds in the other bowl and poke it a bit so there are no lumps. Add your dry to the wet and mix it well. Really get in there press the mix together so the fats are taken up well into the dry. It should all hold together to form a ball like a biscuit/ cookie dough would. Ready your teaspoon, run your hands under cold water (so when making the balls they don’t go all melty). 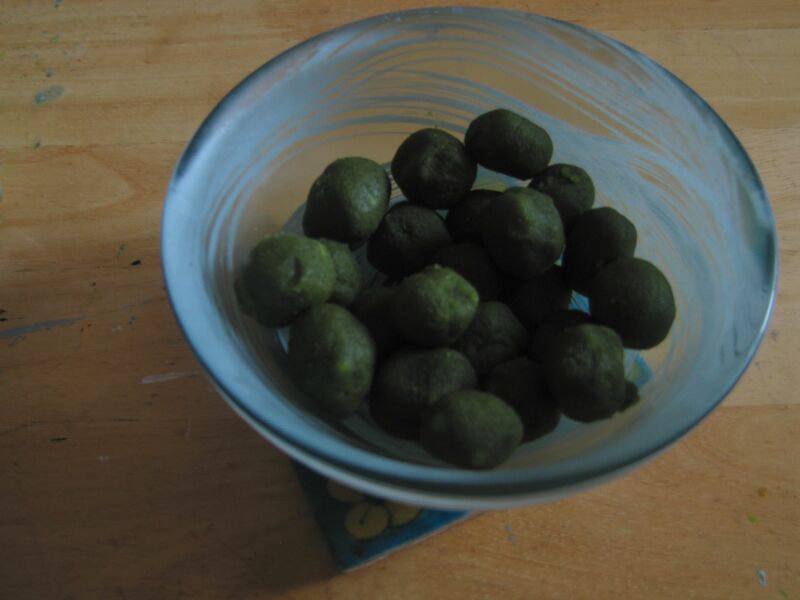 By the teaspoonful roll the mix between your two palms to form little balls and drop them into the bowl you had used for the dry stuff. When done stick them in the fridge for 15 minutes to firm up. Taa- daah! Fabulously a source of antioxidants, chlorophyll, protein (all 9 amino acids in barleygrass), MCTs and magnesium amongst other things, also really yummy! If you have been over generous with your ground almonds and it is a bit dry you could add a splash more extract, add a bit of warm water or non diary milk that has not been in the fridge (if it is cold the coconut oil will re solidify and form bits). If too wet just add more ground almonds. A thing I change up a lot is the coconut oil. I often do one spoon coconut oil and add in one big dessertspoon of a nut butter. The ones that work best are cashew or blanched almond. In regards to the peppermint flavour it really is up to you how strong you like it, I prefer them really minty! I have also used spearmint – a smidge bit toothpastey but nice for a change, also did just plain vanilla using a half teaspoon of vanilla powder or teaspoon of vanilla bean paste.